Our (including new Associate Member, Ann Noble-Kiley) 2018 summer cruise (after a month in the Stockholm archipelago and meeting with Tom Tigerstedt, PO, SW Archipelago, Åland Islands as reported previously) took us through the Åland Islands and the Finnish archipelago, into the Saimaa Lakes (the interior lakes of Finland), to Vyborg and St. Petersburg (Russia) and Tallinn (Estonia) and back to Stockholm via the Åland Islands again. The weather included record-setting high air and water temperatures and little rain. The Åland Islands (an autonomous area of Finland) are located halfway between Sweden and the Finnish mainland. These islands and the Finnish archipelago, south of Turku and Helsinki, comprise a vast and glorious area for cruising – even bigger than the Stockholm archipelago. We spent a couple of weeks in this area. I was also delighted to renew friendship with Max Ekholm, POR Helsinki. Finnish lakes via Saimaa Canal (Russian waters) - The interior of Finland is largely water: a huge system of connected fresh water lakes, 76 meters above sea level. The Saimaa (or Finnish) Lakes can be reached from the sea only through the Saimaa Canal, which is entered through Russian waters at the eastern end of the Gulf of Finland. Midway through the Canal, one crosses the border back into Finland. It is not necessary to have visas for the crew or advanced permission to transit the Canal so long as regulations are carefully followed, e.g. no contact with shore and the vessel must stay in the designated fairway. However, the vessel and crew are subject to intense scrutiny by Russian (and Finnish) authorities. We cruised to Savonlinna, Finland’s opera center, and attended a performance of Madame Butterfly in the 15th century former Swedish castle, Olavinlinna, a spectacular setting. 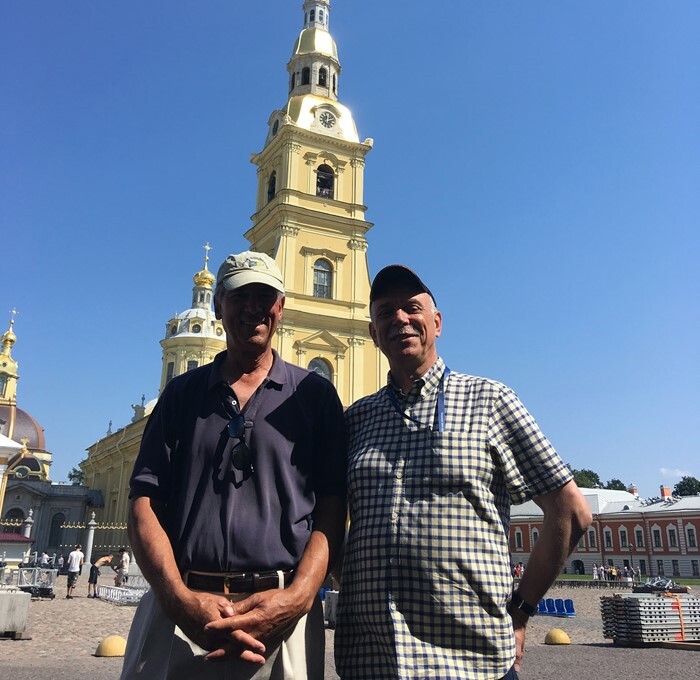 Vyborg, St. Petersburg, Moscow (by train) - Our cruise into Russia was facilitated – no, made possible – by Vladimir Ivankiv, POR, St. Petersburg, “the man who makes everything possible.” For 30 years, Vladimir has been the “representative” of eight yacht clubs in St. Petersburg. He provided us with the formal “invitation” and detailed guidance required to get Russian visas, was in helpful contact with authorities on our behalf throughout our cruise, gave and arranged tours of major sights in St. Petersburg and took us shopping. We were delighted that he his wife, Alla, joined us for a concert and Vladimir came aboard for our last leg from St. Petersburg to the island of Kronshtadt home port to Russia’s Baltic fleet. Leaving Kronshtadt, we passed the fleet returning – an impressive display! Tallinn is a delightful city in which to spend a couple of days. We stayed in Old City Marina, which is expensive but a nice facility and an easy walk to the walled city. Golden Eye is now back near Stockholm for the winter of 2018-19, preparing for more Baltic cruising in 2019. I look forward to meeting members in, or discussions with members about, this region.